The Little Miss is still coming up with surprises. We purchased the shape sorter that you see here about a month or two ago. We wanted something bright, cheery and robust for her to grow into. It rolls around with the hard plastic shapes rattling inside as it goes. Each shape also rattles with it’s own individual sound too. It is a very cleverly designed toy, in my opinion, as it can be used by babies well before they have the motor skills to, or interest in, ‘sorting’ the shapes. And it not only teaches shapes but also how to match colour. My only complaint is the fact that it has two blues, which poses the problem of what to call the dark blue if you are trying to keep it simple for the baby. In good conscience we couldn’t really call it black, so I’m guessing it will become “navy”. Still. It’s a great toy. So far Miss O has been chewing, shaking, sucking and trying to stuff each individual rattle-shape as far into her mouth as she can manage. But over the past week she has started to show signs of using the toy as it is intended. She has been putting the shapes through their holes and into the body of the sorter. 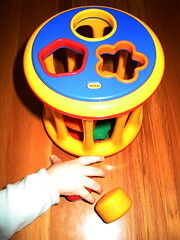 She still requires assistance with this – turning the sorter around so she has the right hole available to her – but she is managing the manipulation of the rattles, which are as big as her hands. Her fine motor control is still a little shaky, but my goodness it is coming along. If she gets the hang of this as fast as she managed to get on her feet and walk, then she’ll have nailed it by the time her first birthday comes along. What continues to surprise me is that these skills seem to come out of nowhere. Of course we have been putting the shapes in and out of their holes, showing her the basics of in and out with one lid off too. It’s not as though we plonked it down in front of her and left her to wonder what the heck it was. But what surprises me is the fact that she has shown no “beginning” attempts to put the shapes through their holes. It seems to have sprung up more or less fully formed. She showed no interest in putting the shapes (or anything else) into any sort of receptacle at all. She was perfectly happy to remove objects from all manner of container, but not in the least interested in replacing them. Then one day last week, there she was, trying and succeeding reasonably well at putting the shapes through the holes. Will wonders never cease? It is indeed, the shape of things to come. For those who may have an interest in toys for children, take a look at the Tolo website. We have several of their toys and find them to be great for our little Miss. She owns the roller rattle (3m+, S9170, in pastel colours), the magic shaker (6m+, S6420, in pastel colours), the roly poly chiming sailor (6m+, S9348), the rolling shape sorter (12m+, S9410) and Sneezy, the Activity Dragon (from birth, 95030). It’s fair to say we like the Tolo toys.